Light became one of Caulfield's most enduring subjects from the time that he began depicting architectural interiors in the late 1960s, beginning in such large-scale paintings as Window at Night, 1969 (sold in these rooms 4 June 2004, lot 116 for £190,950), in which the glow of a single electric light within a simplified lampshade suspended from the ceiling casts a vivid orange glow into an otherwise bare room. Though the depiction even of natural light in his later paintings is exaggerated and schematised to intensify the effect, it was artificial illumination that proved a particular source of fascination in many of his signature works. The moonlike white globe of Dining Recess, 1972 (Arts Council Collection), or the witty spotlighting of a 17th Century still life featuring a lit candle in Interior with a Picture, 1985-6 (Tate, London), are symptomatic of his fascination with light as an intangible substance that accentuates the physical presence and reality of everything in its path. 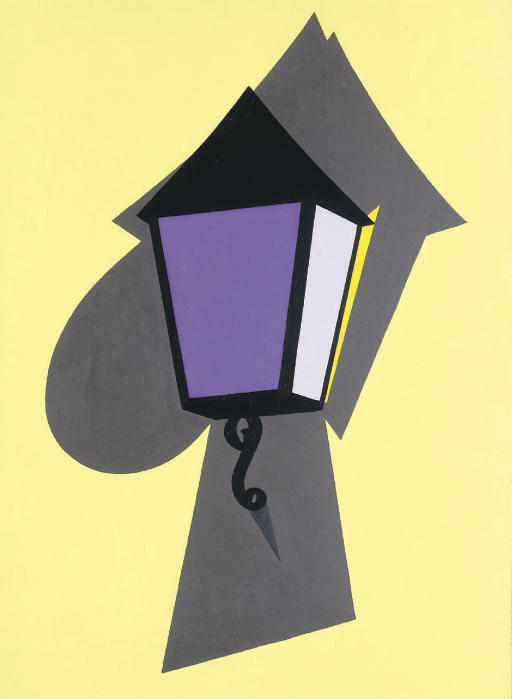 Lanterns and coach lights feature prominently in other paintings by Caulfield such as Patio (private collection) and Lantern (private collection), both of 1988, Rustic Lamp, 1995 (private collection) and Wall Light, 1994 (private collection), a companion piece in horizontal format to this Wall Lamp of the same year. The painting in question here was created specifically as the maquette for a screenprint editioned in 1994 under the same title, at the same time as another print of the same motif, Coach Lamp, both editioned at the Printmaking Workshop of the Royal College of Art in London. Caulfield had made his first limited edition screenprint in 1964 and had long been in the habit of designing such works as maquettes that served as templates for the stencils cut by the specialist screenprinters with whom he collaborated. At first, these often took the form of working diagrams, complete with written notations indicating colours and with undisguised corrections that he knew would be rendered invisible once they had been filtered through the process of cutting the stencils, creating the separate screens and passing the paper repeatedly through the press. By the time he painted Wall Lamp, however, he had come to appreciate these maquettes as independent works in themselves, rather than seeing them simply as studies, and therefore took the same pains as in his other paintings to bring them to a comparable level of finish. In this particular case, comparison with the print version demonstrates that he altered the colour of the two visible facets of the lamp, exchanging the vivid purple and plate grey of the painting for the more prosaic whites of the print. In the painting, moreover, he accentuated the textural variations of the brushwork knowing that in the print these same surfaces would be flat and uninflected because of the way that the coloured inks would be evenly deposited across the surface. Having sought since the early 1960s to remove the obvious signs of his handwork from his paintings, in his later works, Caulfield came to delight in the kind of exaggerated textures that one might see on the walls of self-consciously rustic or exotic restaurants. The same perverse logic that drew him to motifs that he found Kitschy or in questionable taste - such as the wall lamps themselves, which in their combination of cheap materials, cut-price design and stylistic flourishes suggest a low-budget aspirational mentality - was applied to the very technique, in which gestural painterliness has mutated into the domain of the DIY enthusiast. As so often happens in Caulfield's work, the stylishness and simplicity of conception, the elegance and precision of the drawing, the finely judged and emotive use of colour and the delightful details that draw the eye and pin the motif to the surface - such as, in this case, the pointed shadow cast by the wrought iron bracket carrying the lamp - conspire to undermine any sarcastic or satirical motivation that might have prompted his painting in the first place. Rather than mocking what might in its original context have seemed an impossibly corny idea of romance, by the time he has completed his painting Caulfield himself has succumbed to that very emotion, creating a haunting visual emblem of a romantic journey or hideaway that lingers in the memory. We are very grateful to Marco Livingstone for preparing the catalogue entry for lots 98 and 99.